ADI has welcomed an initiative by the Association of British Travel Agents (ABTA) to develop guidelines on animals in tourism and recently participated in their consultation on this issue. Aiming to raise awareness of, and encourage, best practice the guidelines cover various animal attractions covering captive facilities as well as wildlife viewing. Unacceptable practices, which its tour operator members are advised not to offer or support, have also been listed and include bullfighting, animal performances based on non-natural behaviour and travelling shows and dancing bears. 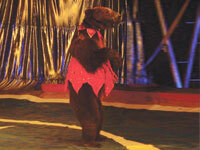 Please support efforts to stop the mistreatment of animals at attractions promoted to tourists. When on holiday, please avoid attractions which compromise animal welfare, and encourage others to do so.